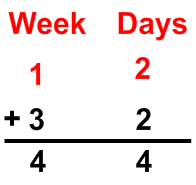 The easiest way to add and subtract mixed time is to set them up like an arithmetic problem and to borrow and carry numbers as needed. The trick, though, is to remember that when you borrow or carry units, you have to convert them. 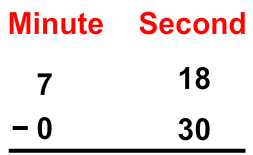 What is the difference between 8 hours and 20 minutes? First, we'll set it up as a subtraction problem. We need to line up the units. 20 minutes from nothing, so we need to borrow. 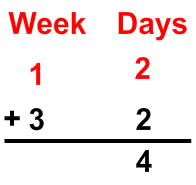 Notice, though, that we are borrowing 1 hour and bringing it over to the minutes column. So, 1 hour is how many minutes? 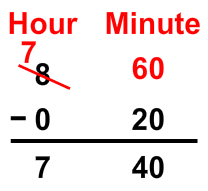 So when we borrow 1 hour, we are borrowing 60 minutes. It took 9 days for seedlings to appear after the seeds were planted. Then it took 3 weeks and 2 days for the plants to reach 5 inches. How long is this total? Joe ran a mile in 7 minutes, 18 seconds. If he could take off 30 seconds from his time, what would his new time be? First we must set up a subtraction problem. Remember to line up the minutes and seconds. Since we can't subtract 30 from 18, we must borrow from the 7 minutes. 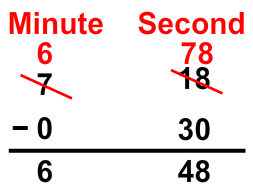 Remember that we are borrowing 1 minute, which is actually 60 seconds. 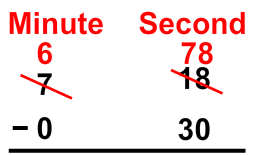 Therefore, we'll need to add 60 seconds to 18.